Traditional Pilates alone is unlikely to successfuly treat your pain or movement problem, however Brain and Body Rehab incorporates Clinical Pilates methods with many other evidence based exercise methods to ensure you achieve the movement skills and pain control you seek. 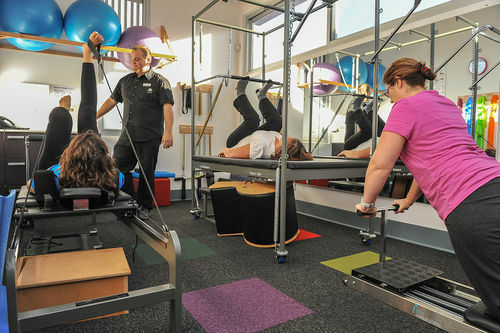 At Through Life Physiotherapy, Body and Brain Rehab utilises high quality Clinical Pilates equipment such as reformer beds and the trapeze table. Rehabilitation equipment also includes weights, fitballs, therabands, Chiballs, and balance boards. Your physiotherapist will also teach you a home program of exercises. Following a detailed assessment, your physiotherapist will develop a program of exercises individually tailored to reach your goals. Your specific injuries, pain, weaknesses or limitations are considered in designing your program. As you improve, your exercises are gradually progressed. Brain and Body Rehab sessions run for up to 45 minutes with a maximum of three participants to ensure optimal individual supervision is maintained. If you require child minding while you exercise look for Body and Brain Rehab + Save Haven on the timetable. If you looking for something more like an exercise class see Clinical Exercise Group. Contact us now for your Brain and Body Rehab Assessment.